Wet work is kitchen and bathrooms, dry work is pretty much everything else. This is where team work comes in if you have been blessed with a cleaning buddy. One of you will do the wet and the other the dry work. Let’s say your home is a 3 bedroom, 2 baths with living, dining, den and eat-in kitchen. From all outward appearances the person doing the wet work will only have 3 rooms to clean, while the dry cleaner will be doing 6 rooms plus possibly a foyer and the laundry room. Yes, you do have to clean the laundry room and the foyer, at least the floors anyway! Don’t fret; amazingly you will somehow finish at or near the same time. If, however one of you finishes first, the other will show some team spirit by pitching in to help, usually with the floors. Based on the size of your home and the filth factor involved, the dry work person may also be the floor person for the entire house which does include mopping. It really doesn’t take a long time to dust furniture and vacuum floors in a bedroom. Cleaning tubs, showers, toilets and cluttered bathroom counters is quite time consuming. Bathroom cleaning will consist of tub, toilet, sink, shower, mirrors and floors. The kitchen will consist of counters, sinks and exterior surfaces of major appliances. You really should keep those blow-outs wiped from the microwave when they occur. If not, then add that to the list. Dishes are not listed here because we are still talking about the basic cleaning which needs to be done every two weeks in most homes. Dishes are, unfortunately, a daily chore. Dry work consists of dusting, sweeping, vacuuming and mopping. That doesn’t seem so bad, does it? 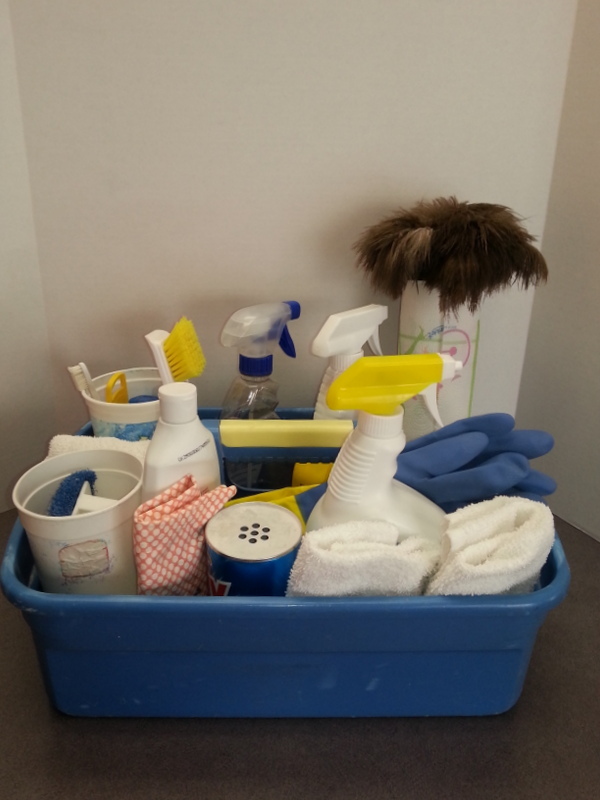 Again, keep all of your cleaning products in the tray or bucket you have for that purpose and carry it with you from room to room. 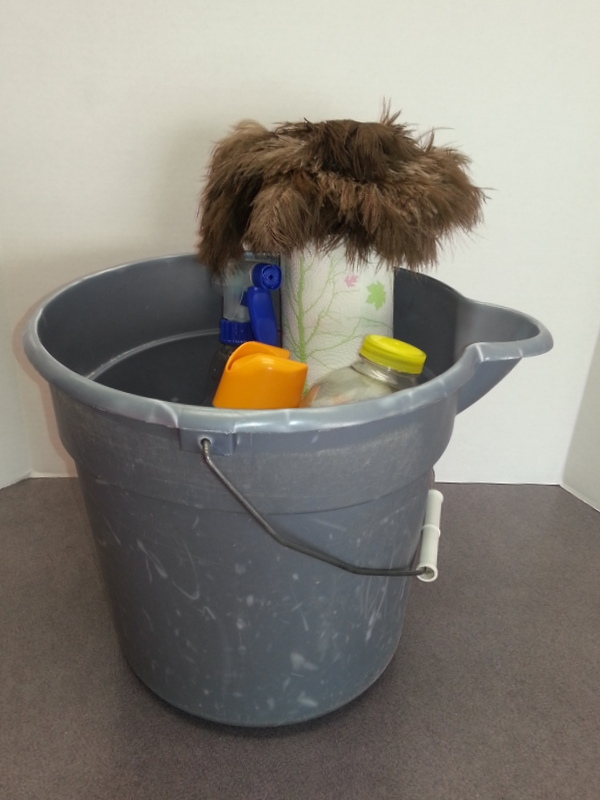 Always keep your cleaning tray or bucket next to you as you work your way around the room. This cuts down on time wasted walking back and forth. Remember your goal is to get this job done as quickly as possible. I recommend when cleaning the wet areas that the first task is always to sweep the floors. More often than not, you will splash some water on the floor during the cleaning process. It is just plain annoying to try to sweep a bathroom floor with wet spots. In the early days of my cleaning business, people would often ask me if I charged to clean bathrooms, my standard response became, “only if you want it cleaned.” The two dirtiest rooms in the house are always the master bedroom and especially that bath. For some strange reason, everyone in the house prefers to use the master bath. The shower will take more time to clean than any other thing in the entire house. I once had a helper to completely clean an entire kitchen in the time it took me to clean a master shower! That one was pretty dirty. Carry a large trash bag with you to empty all the cans into. Simply leave it sitting outside the door of each room as your enter. Dust first or vacuum first, that is the question. What is your answer? That is really a personal choice. As a professional cleaner, I always do floors last. If the floor is carpeted, I vacuum from the far side of the room backward, working my way out of the room. The purpose of this is so that I can create a freshly vacuumed pattern into plush carpet with no footprints. Regardless of the floor surface, always work your way from the far side of the room backwards and out the door so that you are not stepping on the freshly cleaned floor. Always complete one room prior to moving onto the next room. If one of you finishes first, go help your partner. Floors are always the best area for teamwork. If you see, you’re going to finish first, go ahead and let your cleaning partner know that you will be taking over the floors soon. Again, you should be able to get your basic cleaning completed in about 2 hours. If it is taking you longer, make that your goal. If you’re getting it done in less time, woo hoo!! Coming soon, the best products I have found during my last sixteen years as a professional cleaner.